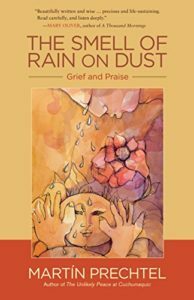 Author Martín Prechtel, who has been trained in the Tzutujil Maya shamanic tradition, writes of his understanding of the connection of grief and praise in The Smell of Rain on Dust: Grief and Praise. In our society we tend to grieve in solitude and silence, pulling ourselves inward and not reaching out to community. However, Prechtel maintains: "Grief expressed out loud for someone we have lost, or a country or home we have lost, is in itself the greatest praise we could ever give them. Grief is praise, because it is the natural way love honors what it misses." Prechtel explains that grief is a phenomenon that contains movement and must be purposefully done. It is active, not stagnant or wallowing. He calls grief "the sound of being alive.....if the sound doesn't go to the core, it's not grief". In the book Prechtel includes a chapter entitled Animals: Grief Orphans are the Doctors. He says "....animals are the grief of the world's losses. They are the tears and songs of the heart of the divine turned into powerful, walking, flying, swimming, furry, hunting, hiding beings whose spirits have never been compromised by having a choice to be other than the powerful beings they really are". He calls them our 'grief relative'. In reading this book, I felt that for the first time I was introduced to the being Grief, a strong, supernatural (meaning in the sense of more than nature, not meant in the occult sense) being that calls us to truly experience our grief in its fullest. The being Grief calls us to honor those who have left our physical life in a raw, bigger-than-life "pain-filled testament of courageous praise they bore [for] whomsoever their heart had lost". When you are ready to expand your experience and understanding of grief, I highly recommend this book. Should you read it, you will be changed and there will be no turning back.